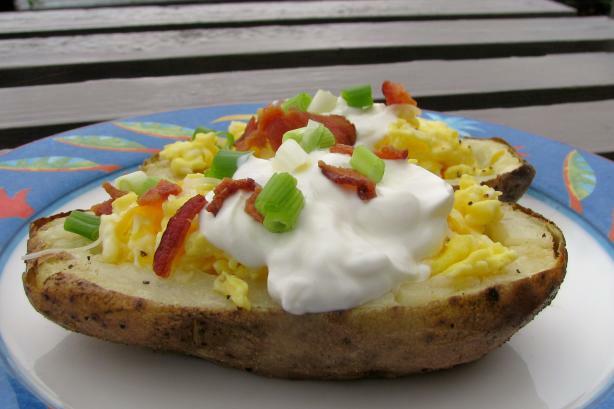 Bake potatoes in the microwave for 10 minutes; turn over and bake another 8-10 minutes. Set aside to cool. Beat eggs in a bowl; add water; beat a little more. Add eggs to skillet and scramble until done. Set aside. Once potatoes have cooled enough to be handled, cut them lengthwise and scoop out the pulp, leaving about 1/4 inch layer of pulp in the skins; discard pulp (or save for something else). Place skins upside down (skin side up) on a greased baking sheet. Combine oil, garlic powder, paprika, salt and pepper in a bowl; brush all over each skin. Bake at 475 degrees for about 8 minutes; turn over and bake another 6 minutes. Remove baked skins from oven. Fill each skin with scrambled eggs and sprinkle top with cheese. Return to oven long enough to melt the cheese, about 1 minute. Remove from oven and add sour cream, bacon and green onions.